If your make-up collection is getting out of control, it’s time to get organised, and we’ve found the best products to help you do just that. Do you have a habit of buying lipsticks only to lose them to various pockets and handbags? With some form of make-up organiser, you’ll be able to neatly store and display all of your favourite make-up for easy access when you need it most. We all have make-up bags, but this tends to be for our everyday cosmetics that we absolutely need to have with us on the go. But if you have a wider selection of cosmetics that are without a home, you may wish to consider something such as a make-up tray for your dressing table or a vanity case that can be easily transported whenever you need it. Ladies who are into their contouring and have a lot of make up brushes, make up carousels or hanging organisers are a great place to store these so that they stay clean and don’t get your make up bag dirty. When taking them on your travels, look out for make –up bag organisers that have separate pouches to keep your brushes in. Whether you’re looking for a simple make-up bag for your handbag or a comprehensive make up storage compartment to display on your dressing table, we have picked a range of products to suit all styles and budgets. If your dressing table looks like it’s been hit by a make-up tsunami, then tidy things up with this convenient rotating make-up holder. Store anything from brushes to face creams and nail varnishes in the different compartments that are easy to reach with one little swivel. This is a compact beauty organiser but has a surprising amount of room for all of your products to fit neatly inside and clearly on display so you can easily pick them out whenever you need them. 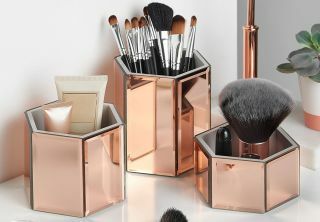 These rose gold storage pots are bang on trend right now and would look great on any dressing table or in the bathroom for organised storage of your cosmetics and other beauty products. You’ll get three different sizes that are perfect for storing anything from make-up brushes to jewellery or even stationary on your desk. If you’re a make-up artist or simple have a huge cosmetic collection that you like to take everywhere with you, then keep everything organised in this handy travel case. It comes with a wide range of pockets and extendable trays for you to separate cosmetics and tools such as brushes and nail polishes. It comes with both a carry handle and a strap for easy transportation making it perfect for beauty obsessives. Applying foundation with a sponge is all very well until your sponge gets ruined from being in your make-up bag all day long. Sponges are a tricky shape and are very delicate so need to be kept clean and dry, which is why these sponge holders are a great way to keep them out of harm’s way on your dressing table. The super cute 'walking chick' design is adorable and have the added bonus of being really affordable. If you’re thinking of a gift for a friend, these will make unique stocking fillers this Christmas. For a simple way to organise your daily make-up, this clear make-up storage tray is the ideal way to separate different cosmetics. From brushes to pencils and eyeshadows, there is a place for everything but it may not be sufficient if you have a very comprehensive cosmetics kit. This could also be used in the bathroom for beauty and skincare products. For the ultimate make-up storage, this mirrored cabinet makes for a great bedroom feature. You’ll get a standing mirror with LED lighting that is perfect for applying your make up, and a hidden storage cabinet where you can carefully organise your cosmetics and even hang jewellery for easy access to everything you need when getting ready in the morning. It also has hanging space for beauty appliances such as a hair dryer or straightener making it the ultimate beauty queen must-have. This 6 tier make-up storage drawers set is perfect for medium-sized make-up collections and is ideal for dressing tables or for professional make-up artists to store their cosmetics in a way that is easy to access. The flip-top lid on the top tier allows you to keep it open for displaying products or closed to neatly tidy everything away. The drawers open out smoothly and you’ll never have trouble locating your favourite lipstick with the transparent tiers that make it easy to see inside each drawer. This transparent make-up storage box with drawers is ideal for make-up brushes and sponges, as well as pencils and lipsticks. It comes with pretty filler beans that make this a decorative way to store and display your cosmetics and is completely dust-proof so it keeps everything clean. Its compact design would fit nicely on a dressing table or shelf and allows you to easily locate your favourite beauty items at a glance. Pick out your eyeshadow colour for your night out with ease when they are displayed in this handy make up tray. This is one of the best make-up organisers for eyeshadow as you can clearly and neatly stack your favourite shades on your dressing table. The only downside is that this doesn’t fit other types of cosmetics, but if you are an avid collector of eyeshadow colours, this is the perfect way to keep them organised.